A leading neurologist at Beaumont Hospital has told how he has treated five fighters who suffered a brain haemorrhage as a result of MMA fighting. Despite its growing popularity, particularly through the achievements of world superstar Conor McGregor, MMA is still not fully recognised as a legitimate sport in Ireland. And although the whole area of mixed martial arts has drawn much criticism in recent years, it remains one of the fastest-growing sports in the country. Last week, American MMA fighter Ronda Rousey's mixed martial arts career was brutally cut short after she was knocked out in just 48 seconds in the main event of UFC 207. Speaking at a special event at the Royal College of Surgeons, in Dublin, Professor Dan Healy addressed more than 50 high-level MMA fighters on the dangers of chronic traumatic encephalopathy (CTE), a progressive degenerative disease found in athletes with a history of repetitive brain trauma. While he stressed MMA brought "huge advantages", he believed people needed to be "realistic", and greater awareness was needed about the dangers of long term brain damage from such a highly physical sport. "I'd like to see every young man and woman who decides to fight to do so knowing that every possible avoidable risk has been minimised," he said. "I've seen five brain haemorrhages in Irish MMA. The fighters were a variety of ages, both amateur and professional. It included people in their twenties and early thirties. "CTE concerns me more than anything about all combat sports. This can be the first generation of fighters ever who don't get CTE." Speaking to the Sunday Independent, McGregor's coach John Kavanagh admitted that McGregor harbours concerns about the long-term implications of repeated blows to the head. But he added that 28-year-old McGregor had mastered a particular technique which minimise his chances of receiving heavy blows to the head and surrounding area. "It's a concern of every fighter. At that level of fighting the risk is very real," Kavanagh said. 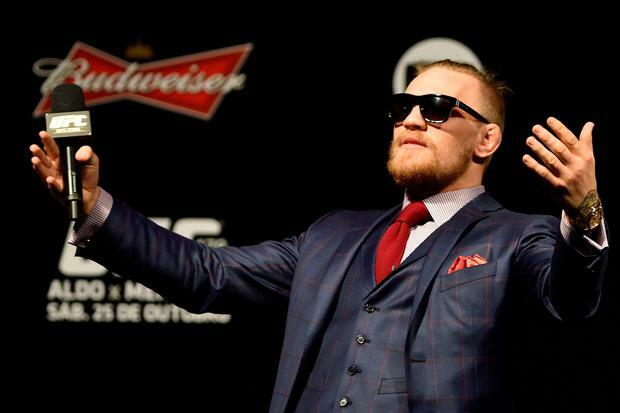 "But I think you can add on two hands the number of clean head shots Conor has taken in 10 years of pro-fighting. His style of fighting answers that, because his style is not brawling. He doesn't step in the pocket and exchange punches. "His style is in and out - he's very defensive. That style was born through not wanting to lose and not wanting to take head shots, and not wanting to damage the software." Meanwhile, Sports Minister Shane Ross said he intended to introduce greater regulation for MMA, labelling elements of the sport as "disturbing". His department is looking at various options, and has declined to say whether Ross considers MMA to be a sport in the strict sense of the term. While Kavanagh agreed with the minister's position that MMA should be "strictly regulated", he said Ross should not bother watching it if he believes elements of the sport are "brutal". "Some people think rugby and NFL are brutal," he added. Kavanagh said the reality was that any fighter taking part in combat sport could develop CTE over the course of their career. However, he stressed the key to protecting the long-term health of athletes was through education. He said: "We can reach that lofty goal of this being the first generation with no incidents of CTE."